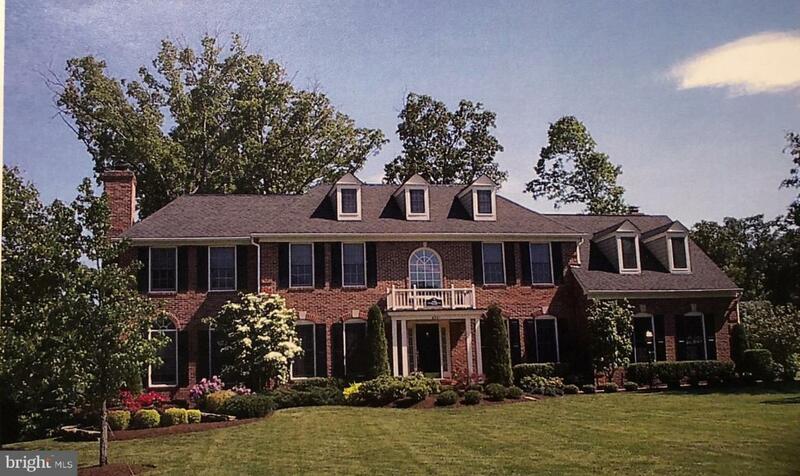 This striking 5 bedroom, 4 and one-half bath executive home is located on an almost three-quarter acre wooded lot on the entrance to a cul-de-sac in the highly desirable Virginia Run community. Dramatic two-story foyer with nine foot ceilings on first floor. Custom floor plan includes: family room with cathedral ceiling, fireplace and built in book shelves; sun room with fireplace; study with built in book shelves; as well as formal living and dining rooms. Magnificent master bedroom suite including sitting room with fireplace, two walk-in closets, and luxury bath with jacuzzi tub. Three other generous bedrooms on upper level. Fully finished basement includes another bedroom suite, full bath, media/family room and game room with pool table. Over 5000 sq.ft of finished living area. Professionally landscaped grounds include mortared brick sidewalks, tri-level deck, sprinkler system, and terraced beds faced with stone walls. Country living in a secluded neighborhood on a quiet cul-de-sac. Short walk or bus ride to Va Run Elementary School as well as short bus ride to Stone Middle School and Westfield HS. Minutes to route 66, shops, restaurants, and golf. Recent improvements include: new roof, furnace, attic heat pump, 2 exterior A/C compressor units, gutters, window screens, and Deck Helmet sealing on decks. Many items convey including grand piano, pool table, and hot tub to the right buyer.